Buy-a-box promos are cards given away for purchasing a booster box at certain local stores. 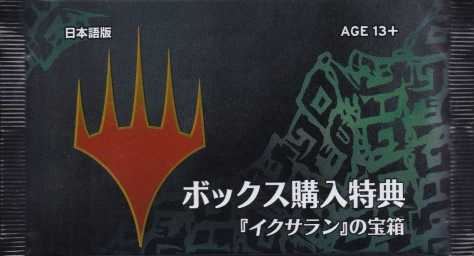 They are foil cards with alternate art, and some of them bear the five mana symbols arranged in a circle, a faction symbol, a clan symbol, a guild symbol or a set symbol as a watermark. * Receive one stamp for every booster you buy. * Receive five stamps for every Intro Pack you buy. 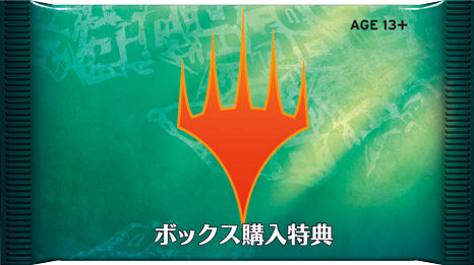 * Get three BONUS stamps just for playing in Open Dueling at prereleases and launch parties! The Buy-a-Box promotion encourages in-store sales of booster boxes. Core-level-and-above WPN members who sign up in Wizards Event Reporter will receive a number of promo cards based on store level. To help customers participate in this promotion, your store will be listed in the Wizards Store and Event Locator as a Buy-a-Box promotion location. Amonkhet will be the last season where Core-level and above WPN members must sign up in Wizards Event Reporter to participate in the Buy-a-Box program. Even if you have already reviewed and agreed to the new WPN Terms and Conditions, you still need to schedule Buy-a-Box: Amonkhet to receive your kit. Beginning with Hour of Devastation, you will be automatically enrolled. For the release of Ixalan on September 29, 2017, a foil alternate art Buy-a-Box promo card (Burning Sun's Avatar) and a Buy-a-Box booster (only available in English and Japanese) were given. Each Buy-a-Box booster contains an extra Buy-a-Box promo card (giving you a total of two Dinosaur Avatars!) and the equivalent contents of two Standard Showdown boosters. The Buy-a-Box promo booster pack contains also two of the Rebecca Guay foil Standard Showdown basic lands promos. 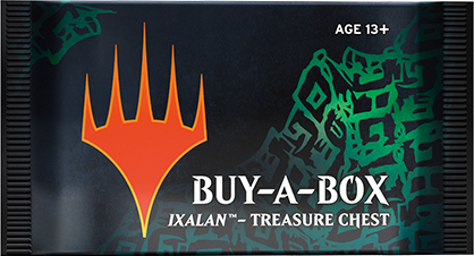 Starting November 24, 2017, for Black Friday while purchasing a box of Ixalan, you'll receive a Buy-a-Box Treasure Chest booster (only available in English and Japanese). These boosters are similar to the normal Ixalan Buy-a-Box packs, but instead of the Buy-a-Box promo card, each booster will contain an alternate-art, premium foil double-faced card from Ixalan. Starting November 24, 2017 the promotion was extended to either buying a box of Ixalan, Unstable, Iconic Masters or if you buy any booster box back to and including Kaladesh, you can receive a Buy-a-Box Treasure Chest booster. 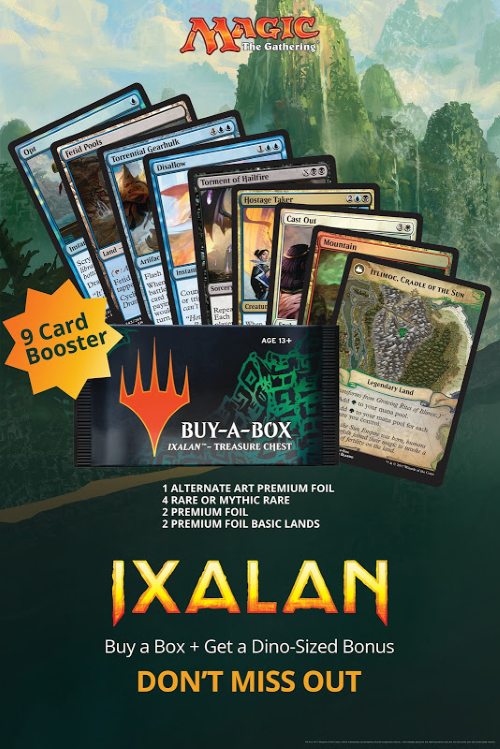 In the APAC region, this promotion applies only to in-store purchases of Ixalan booster boxes.